“A great deal has been said about the weather, but very little has been done about it.” This quote has been attributed to Mark Twain, Charles Dudley Warner and several other people, but whoever said it was right on the money. Here we are, well into January, and the threat or promise – however you want to look at it – of El Nino has been hanging over us for weeks. Almost nightly on the news we see Dallas Raines forecasting torrential rains any minute now. But nothing happens. Vera in the evening and Henry in the morning on KTLA point toward their weather maps showing storms out in the ocean, heading right for us. Get ready! Gear up! Don’t leave home without your umbrella! And nothing. 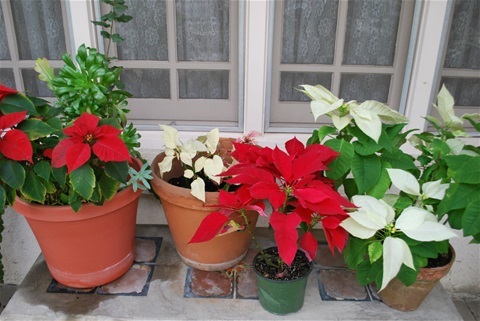 The sunsets and sunrises have been fabulous and the sun came out long enough this morning for me to plant three of the leftover Christmas poinsettias in a big pot. I don’t know what it is about Christmas poinsettias, but I’ve been having great success with them the last few years. I had an enormous white one and an equally enormous red one out on our front terrace a couple of years back but then an invasion of white flies found them and, friends and fellow gardeners, when the white flies show up you might as well dump your plant and move on with your life as nothing you spray on them impresses them at all. God, obviously, likes gardens, flowers, trees, plants. “The Lord God took the man and put him in the Garden of Eden to work it and take care of it.” Gen.2:15 Notice that part about work. Nothing in your garden flourishes without you doing stuff to it. For instance, weeding. No more needs to be said about that. “In simple humility, let our gardener, God, landscape you with the Word, making a salvation-garden of your life.” James 1:21 What a beautiful word picture this is...landscape you with the Word... I promised myself at the beginning of the year that I would read my Bible every day. I’m doing fairly well, some days I need to play one-day-catch-up, but I’m enjoying it. I’ve just been reading about Jacob and his sojourn with his sneaky relative, Laban. You know, where he promised to work seven years to have Rachel as his wife and then Laban snuck Leah into Jacob’s tent instead. Then another seven years of shepherding to pay for Rachel. More double-dealing over sheep and goats. Meanwhile, in Matthew, Jesus is sending his disciples out into the world to start spreading the Good News. “The Lord will guide you always; he will satisfy your needs in a sun-scorched land and will strengthen your frame. You will be like a well-watered garden, like a spring whose waters never fail.” Is.58:11 Which gets us back to “....no matter what the weather, always bring your own sunshine.” I want to be like that spring whose waters never fail, sharing good news and sunshine with those around me. I’m going to the Apple store to discuss my phone with them next Monday, and even though the supercilious young “Genius Bar” employees will view me as an elderly (that’s anyone over 30) person, I shall bring my own sunshine and scatter it over them, no matter what! Let your little light shine, too.